Resident outcomes have come under growing scrutiny, both through new quality measures and the overall star rating. Nurses are the frontline staff who engage with residents daily, and it’s crucial for them to understand how to apply critical thinking. When caring for residents and creating documentation, critical thinking can improve facility and resident outcomes while reducing medical errors, which will ultimately lead to more accurate reimbursement. 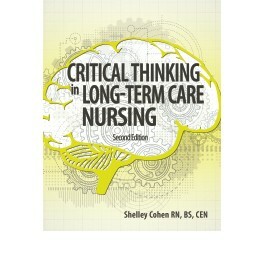 Raise the standard of professional nursing practice and teach clinical care providers how to function at a higher level by developing their critical thinking abilities.Critical Thinking in Long-Term Care Nursing, Second Edition, provides nurse managers and educators with accessible ways to teach these valuable skills to their staff. This easy-to-read resource explains the principles of critical thinking and how to encourage nurses to use critical thinking methods. Author Shelley Cohen, RN, BS, CEN, provides guidance on how to lead classroom sessions for new graduates and experienced nurses to develop critical thinking skills, including classroom processes and learning strategies. The book includes handouts to supplement classroom training. Developing a culture of critical thinking in nursing is crucial in today’s long-term care industry. Resident outcomes have come under growing scrutiny, both through surveys (new quality measures) and overall star ratings. Nurses are the frontline staff that engage with residents daily, and they need to understand how to apply critical thinking to nursing. Critical thinking during documentation can improve outcomes in their facility, which will ultimately lead to accurate reimbursement. This update will cover the new quality measures and discuss how nurses’ actions and documentation affect the facility’s star ratings. Shelley Cohen, RN, BS, CEN, is the founder and president of Health Resources Unlimited, a Tennessee-based healthcare education and consulting company. Through her seminars for nursing professionals, Cohen coaches and educates healthcare workers and leaders across the country to provide the very best in resident care. She coauthored the book A Practical Guide to Recruitment and Retention: Skills for Nurse Managers, also published by HCPro.